During the month of December, there are a lot of wonderful things going on from City Park lights to snow on Fulton Street, but did you know that we will also have a video-mapping projection art show? 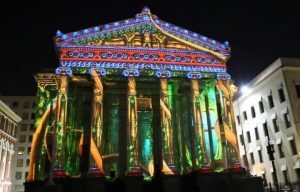 If you have never experienced this “light show,” you really must come out and see the New Orleans Luna Fête. LUNA Fête is a visionary initiative created by the Arts Council New Orleans in 2014 to utilize our city’s iconic landscape as the canvas for outdoor, public artworks created with light and technology. This multi-day celebration features illuminated installations, digital sculptures, video-mapping projections, and art animated by technology – intended to engage and inspire audiences of all ages. The Arts Council plans to expand the physical campus of LUNAFête each year across the city of New Orleans leading up to the 2018 Tri-Centennial. Free and open to the public, LUNA Fête 2016 will begin on Wednesday, December 7th running 6 – 9 PM nightly in Lafayette Square through Saturday, December 10th and feature a roster of international, national, and local artists. Click here for details. Please stop by Mulate’s Restaurant for a bite to eat before or after the show. Mulate’s is known as the original Cajun restaurant, famous for preserving and celebrating the food, music and culture found in the small towns and along the bayous of south Louisiana. But the restaurant that prides itself on being true to its roots would never have opened its doors if owner Kerry Boutté hadn’t ventured out of Cajun Country and into restaurants and dance halls of New Orleans, Houston and even Europe. There is a lot to learn about us, so just stop in an experience the original Cajun restaurant. Click here to learn more about Mulate’s.